One of the most important interventions in Vatican II, made before the assembly of more than 3,000 Bishops, was that of Card. Joseph Frings, Archbishop of Cologne. In it, he strongly criticized the methods of the Supreme Congregation of the Holy Office, renamed after Vatican II as the Congregation for the Doctrine of the Faith. Card. Frings' intervention received a standing ovation by the majority of the assembly, primed to give this response. It has been said that on that day - November 8, 1963 - the Holy Office virtually died. Time confirmed this verdict. In a book about Vatican II, Card. Henri de Lubac reports that the author of Fring's intervention was none other than Fr. 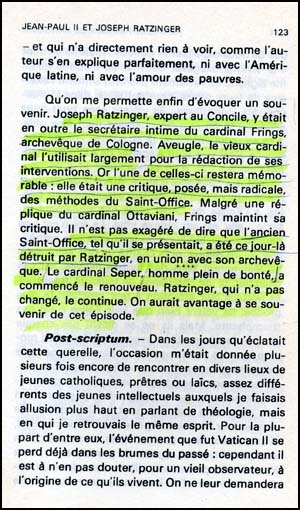 Joseph Ratzinger, his personal secretary. Then, the choice of Ratzinger for Prefect of the Congregation for the Doctrine of the Faith would have been to carry out the destruction that he initiated in that intervention. In his book, Card. de Lubac describes what happens. At right top is pictured the cover of Entretien autour du Vatican II[Discussion about Vatican II]; at right, a photocopy of the French text. At left below, we present our translation of the paragraph highlighted in yellow. Allow me to recall something that happened. Joseph Ratzinger, an expert at the Council, was also the private secretary of Card. Frings, Archbishop of Cologne. Blind, the old Cardinal largely utilized his secretary to write his interventions. Now then, one of these interventions became memorable: it was a radical criticism of the methods of the Holy Office. Despite a reply by Card. Ottaviani, Frings sustained his critique. It is not an exaggeration to say that on that day the old Holy Office, as it presented itself then, was destroyed by Ratzinger in union with his Archbishop. Card. Seper, a man full of goodness, intiated the renovation. Ratzinger, who did not change, continues it. It would be good to keep this episode in mind. 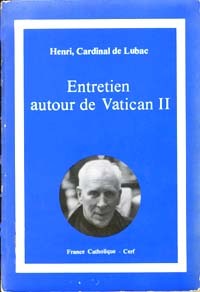 (Henri de Lubac, Entretien autour du Vatican II, Paris: Cerf, 1985, p. 123).